Lt. Colonel John C. Meyer was born April 3, 1919 in Forest Hills, Long Island, New York. He enlisted in the USAAC in November, 1939 and was commissioned a 2nd Lt. in the Air Reserves as a flying instructor in July, 1940. 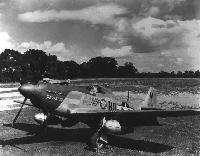 This was Meyer's thrid plane in the 352 Fighter Group. His fist plane, a P 47, was named "Lambie" and his second plane was a P 51B named "Lambie 2". This was his first P 51D Ser. No. 44-14151. Meyer flew this plane until a new Cpl. was towing this plane when he backed it into an object and damaged the elevator. Terrifed about damaging the squadron C.O. plane, he told Meyer's ground crew about the mishap, and they covered his fanny and got Meyer a new plane from the depot. Meyer never new about the incident. This plane was repared and assigned to Lt. Sheldon Heyer who had to be told he had to give up his P 51B "Sweety Face" which he liked better than the P 51D. He renamed this plane "Sweety Face" also, its code was HO-N. Colonel Meyer received his third DSC for Outstanding Leadership on January 1, 1945, Y-29, Asch, Belgium. He was seriously injured in a vehicular accident in Belgium on January 9, 1945 and returned to the USA for recuperation. He later continued air combat as Commander of the 4th Ftr. Interceptor Group during the advent of the F-86 Sabre, Korean War and destroyed two MiG-15 jets. Considered one of the most outstanding combat flying leaders, all but one of Meyer's Air Combat victories were against single-engined fighter a/c, including two MiG-15's in Korea - The one exception: An Ar 234B jet bomber on Dec. 31, 1944. The 487th FS, operating with IX TAC at Y-29/Asch, Belgium, were ready and able to defend against Luftwaffe attackers during "Operation Bodenplatte", Jan. 1, 1945 thanks to Meyer's foresight in delaying "New Years Eve" celebrations. Meyer had 12 Mustangs ready for patrol when enemy a/c appeared over the airfield, 11 of the 12 Mustangs shot down 10 Bf 109 + 13 Fw190 fighters against 1 Mustang damaged to "friendly AA fire" in what became known as "The Legend of Y-29" - Meyer scored his 23th & 24th confirmed victories, received his 3rd DSC for leadership and the 487th Ftr. Squadron received the only DUC, usually reserved for Ftr. Groups, awarded to a Ftr. Squadron of the 8th AF. During the Korean War, Meyer directly oversaw the first F-86 vs. MiG-15 air to air combats. He was later promoted to Lt. General C.I.C. Strategic Air Command.